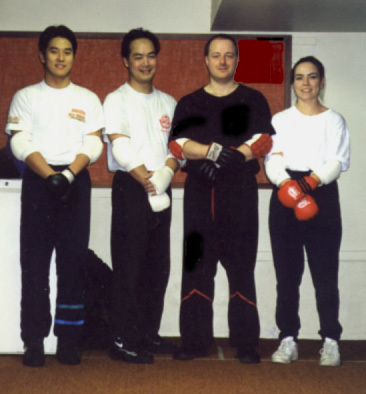 Review Of My Six Month Course "Realistic Self-Defense (RSD), March 1997"
S ix months ago a friend of mine told me that she was interested in looking into a womens self defense course and invited me to come along. I too, was interested and had been for years, in finding this type of class or martial art to join. I had always been interested in karate, partly because my brother took it up and partly because it seems exciting. The movies have always shown the "karate guy" taking victory over the bad guy with the knives or guns. Whenever anyone (black belt or not) is pitted against a martial artist, the latters moves always appear superior and are exhilarating to watch. However, in demonstrations and/or competitions I have seen (live & on TV) the more I have wondered why martial artists always choose another martial artist to demonstrate the effectiveness of the moves they teach instead of an experienced street fighter. For example, the chances of getting attacked by someone else who knows karate could be very slim! All of this has made me question the purpose of karate more and more as to whether it could be defined as a self defense or a sport. Clearly, by now I have noticed a few flaws or misgivings and have decided that it isnt an infallible medium by which to defend oneself in a street situation. Over the years Ive had the experience of wrestling and play fighting with brothers and boyfriends and this has discourage me somewhat into believing that as a woman I would not have much hope in a real situation if something dangerous was to happen. First of all, men have always had the physical advantage over women even if they are of a smaller height and weight. Secondly, they grow up differently learning how to fist fight at an early age and also learn how to endure more pain than women. With this much experience and physical advantage it seems nearly impossible for a woman to be able to challenge a man. I have also seen people, either in person or on TV, demonstrate little techniques which are supposed to stop or control another persons actions. Unfortunately, these too were only demonstrated on willing participants who knew what was going on and this did not leave a good impression on my mind. What did leave a lasting impression on me was the first introductory session to Wing Tsun Kung Fu six months ago. It was shown how other styles and techniques were ineffective to the average attacker but also how different Wing Tsun is from any of them. In the beginning, when I signed up for the class, my expectation were modest. First of all, I couldnt believe that the class was going to be free of charge. One of the reasons which prevented me from signing up for karate years ago was the cost of the lessons. I hoped that during the 6 months I would gain more knowledge of Wing Tsun, apply the principles, and use these to hopefully dissipate some old fears and to develop greater self confidence and courage. I have never been attacked by a stranger and gratefully so because I had felt I wouldnt have much of a chance in that type of situation. Physically, I hoped to develop more strength, flexibility and speed. Overall, I hoped that the experience would be positive and that I would benefit from it. My main goal was to complete the course and set more goals at the end of 6 months. I wanted to feel out the course, see if it was right for me, and decide whether to stick with it and for how long. At the beginning I was not sure if teaching would be a possibility for me. Again, that depended on what happened at the end of the 6 months. Now that the six months has come to a close, I have come to a few realizations. First of all, I have discovered that Wing Tsun is more difficult and complicated than I had expected, mostly because of the completely different mindset that one has to put him/herself in. In most other types of self defense or martial arts, the main idea is to keep distance between yourself and your attacker so as not to get hurt. Obviously, these principles are completely opposite to anything I have ever seen or heard of and so they are a bit difficult to get used to. However, they make perfect sense and this is why I wish to continue on and learn as much as I can. Wing Tsun is something that requires a lot of patience, self discipline and motivation. More than that, it requires faith that the system will work for you when and if you ever need it. On my own, I would not feel qualified to teach this to other students without a great deal more practice and knowledge. However, I do see this as a possibility in the future when I am a little more confident in my abilities. Until then, I will train and practice harder until this becomes a reality. Please click here to view photo. Use then your browsers "Back" button to go back to the article page.